HOPE’S Wing is a non-profit providing services to cancer patients and their families in Iredell and Alexander Counties. 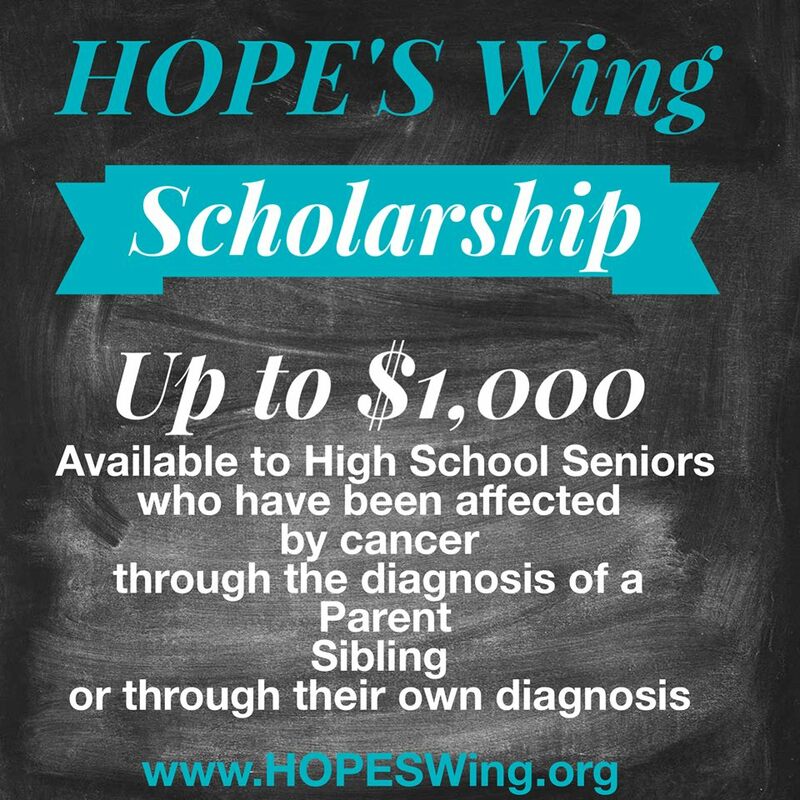 The HOPE’S Wing Scholarship is designed to support young adults who were affected by cancer through the diagnosis of a parent or through their own cancer battle. 1. Must have or have had a parent or guardian diagnosed with cancer during the applicant’s lifetime or must be a survivor of cancer. 2. Must be accepted to an accredited 2 or 4-year college or university. 3. Must show proof of good standing with a 2.5 GPA or better. Student essays, grades, and letters of recommendation will be considered when awarding this scholarship. The HOPE’S Wing Scholarship shows no bias toward students of any particular race, religion or gender, none of which will be considered in choosing scholarship recipients. The scholarship recipient will be selected by the HOPE’S Wing Board of Directors. All applications will be considered that meet the application criteria. Deadline for applications is April 1st. We will make every effort to notify the scholarship recipients by May 1st. Students who are offered a scholarship must accept or reject the scholarship within 10 days of receiving notification they have been offered the scholarship. Failure to do so will result in the loss of the scholarship. • The scholarship will be paid directly to the college or university’s financial aid office where the student is attending.